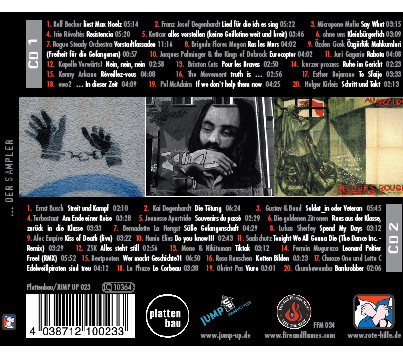 Rote Hilfe Soli/Benefit Double CD! Its taken a while, but finally it has arrived! 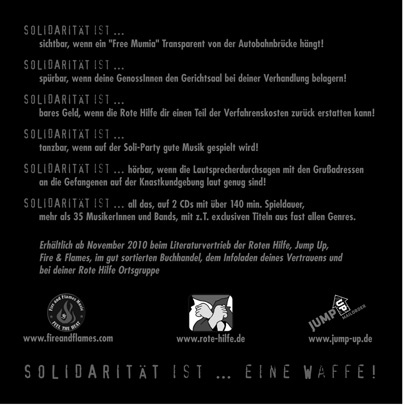 This benefit sampler for the „Rote Hilfe,“ produced by Fire and Flames Music and Jump Up, reads like a whos who of political music. Two CDs, and 40 songs from artists such as Microphone Mafia, Irie Revoltes, Kettcar, Rogue Steady Orchestra, Brigada Flores Magon, Juri Gagarin, Kapelle Vorwärts, Brixton Cats, Kurzer Prozess, Keny Arkana, The Movement, Esther Bejarano, Ernst Busch, Turbostaat, Jeunesse Apatride, Goldenenen Zitronen, Bernadette La Hengst, Lukas Sherfey, Alec Empire, Saalschutz, ZSK, Mono and Nikitaman, Fermin Muguruza, Chaoze One/Lotta C, Obrint Pas, Chumbawamba, and more! 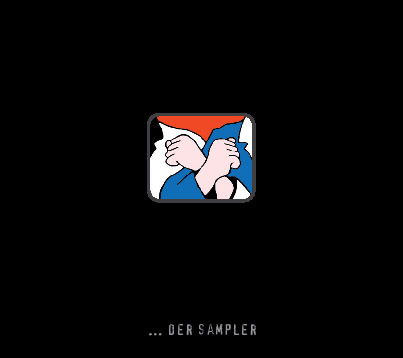 The booklet contains a detailed history of the „Rote Hilfe,“ as well as lyrics to all the songs. Jeunesse Apatride: Alive and Kicking! New 7″ 2011 and (hopefully) European Tour! One of the first bands Fire and Flames had the pleasure of working with, and one of the closest to our hearts…personal connections, frequent visits, joint tours, political affinity, Redskin world…all the ingredients were there. You long thought them to be dead, and in all honesty, so did we. The video below is definitive proof to the contrary. Jeunesse Apatride, alive and kicking, live in Montreal May 2010…. If all goes well, it should be less than a year before we have them here on tour again! In the meantime, for those of you lucky enough to be in North America, we suggest the following event…. Du browst gerade in den Fire and Flames Weblog-Archiven nach dem Tag 'jeunesse-apatride'.